It’s been estimated that as many as 65 million adults in the U.S. care for an elderly, chronically ill or disabled individual. On average, they provide 20 hours of care weekly and receive no compensation in return. These spouses, children, friends, and grandchildren are the foundation of long-term, at-home care in the United States. Many bear this burden out of love, a sense of responsibility or loyalty, or for altruistic reasons. 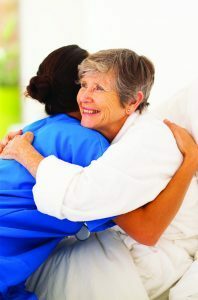 While providing care to someone can be very rewarding, it can bring with it both physical and emotional consequences. According to the U.S. Centers for Disease Control and Prevention, unpaid caregivers are at increased risk for stress, depression and poor health. Caregiver burnout is a very real concern, affecting not just the caregiver, but families, friends and the care recipient. Caregiver burnout is defined as a debilitating psychological condition brought about by unrelieved stress. It may not be 100 percent possible to avoid burnout, but there are things you can do to lessen the risk. Prioritize. Figure out what’s important and focus on those tasks. Priorities are likely to change daily, if not more often. Don’t feel like a failure when it happens. It’s difficult, if not downright impossible, to predict what will be important tomorrow. Be as flexible as you can! Organize. Not only does being organized make it easier for you to accomplish the important things, it makes it easier for others to come in and help. Keep a current list of medications, physicians and other healthcare providers. Know where insurance cards are and have copies of living wills and durable powers of attorney on hand. Don’t lose yourself. Providing care to another can become overwhelming, stripping away the core things that make you, you. Be sure to set aside time for yourself – to pursue hobbies and activities that you love, to visit with friends, to travel. To care for others, you must first care for yourself! Find someone to talk to. Talking with someone who understands what you’re going through and who isn’t affected by the situation can make a big difference. If you have trouble finding someone, talk with your doctor, call the local mental health center, or look online. When people ask if they can help, take them up on it! All too often, caregivers feel that they, and they alone, must do all the work involved in caring for an ailing or aged family member. Nothing could be further from the truth! People offer to help because they genuinely care about you and the person you’re caring for. Carry with you a mental list of things people can do to ease the load. The list might include things like picking up prescriptions, helping with laundry, grocery shopping, staying with the individual while you get your hair done, visit your doctor or get a massage. Don’t be afraid to hire someone to help. There will be times that you just need a break. When that’s the case, consider a respite care provider, like Care Companions of Ohio. Care Companions serves residents out of our four facilities in Mansfield, Marion, Norwalk, and Portsmouth. Care Companions can give you the time and space you need to take care of yourself while ensuring your loved one’s needs are well-met. Services include help with bathing, dressing and bathroom; companionship services, such as reading visiting and playing games; shopping (groceries, clothing, pharmacy); transportation to medical appointments, the beauty/barber shop; cleaning and laundry services; meal preparation, and more. Care Companions of Ohio can be reached by calling (855) 703-8209.